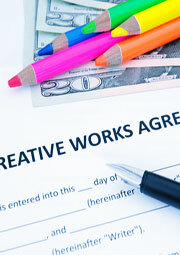 A work-for-hire contract serves a couple of very important purposes! Not only does it describe the scope of the commissioned work and the terms and conditions i.e. deadline, payment terms etc., it also clearly establishes the relationship between the parties as that of independent contractor and client. Most importantly perhaps, it serves as written agreement between the parties as to who owns the copyright in the work and if this is what the parties agree to, it will stand even if it is contrary to what is established in law. The work for hire agreement further down on this page caters for commissioned work by freelancers/independent contractors. This type of agreement is best executed before work commences. In an employment situation you could make use of our Invention and Copyright Assignment for Employees. works made for hire and moral rights before using our templates. The Contractor undertakes to deliver the completed Work to the satisfaction of the Company by the ____ day of ______________ 20___. The Company shall pay the amount of $___ (__________________dollars) upon receipt of the completed Work as total compensation for the work and all rights in the Work. a) The parties agree that the commissioned Work done by the Contractor pursuant to this Agreement shall be deemed "work for hire" under Copyright laws of _______________ and the Company shall own the Work and shall be the full and exclusive owner of all rights and title in and to the proceeds of the services commissioned herein at all stages of development, including any ideas, discoveries, inventions or products developed. b) If for any reason the Work or part thereof is not deemed a work for hire, then the Contractor hereby irrevocably transfers and assigns to the Company in perpetuity, all rights, title and interest therein including all copyrights and any other applicable intellectual property rights. c) The Contractor shall not do anything or cause anything to be done to limit or infringe the Company's rights under this Agreement and undertakes to execute any document required by the Company to secure the Company's rights in the Work. d) The Contractor waives all moral rights in the Work and the Company may make any changes or additions to the Work at their sole and absolute discretion, is under no obligation to use the Work or to credit the Contractor with authorship in the Work or part thereof. It is understood and agreed by both parties that this Agreement does not create or establish an employment relationship. The Contractor shall operate as a self-employed independent contractor and shall assume all risks, expenses, insurance coverage incurred in providing work or services under this Agreement. The Contractor shall not be entitled to any rights or benefits provided to the Company's employees. The Contractor may provide similar services to a third party, subject to the Confidentiality clause in this Agreement. The parties agree to provide relevant documentation required for financial reports and taxes. The Work and all related material and information and any proprietary information or trade secrets or any business information exchanged between the Company and the Contractor shall be held in strict confidence and may not be disclosed by the Contractor directly or indirectly to a third party unless authorised to do so by the Company in writing. This provision shall continue to be effective after completion of the services or Work. Contractor hereby represents and warrants to the Company that the Work shall be original and where applicable, the Contractor has the rights or licences or other permissions required to execute the Work and it shall not infringe upon the copyright or intellectual property rights or personal or privacy rights of any other person or entity. The Contractor hereby agrees to indemnify the Company from any damages, claims or costs, including attorney's fees arising out of breach of the representations and warranties set out in 5. above. a) This Agreement constitutes the entire agreement between the parties, replacing any prior agreements between them and any amendment hereto shall be effective only if made in writing and signed by both parties. b) This Agreement shall be binding upon the parties and accrue to the benefit of their heirs, successors, legal representatives and assigns. c) This Agreement shall be governed and construed in accordance with the laws of ________________. If any part of the Agreement is judged by an appropriate court of law as invalid or unenforceable, it shall be modified to the extent permissible in law and in any event shall not affect the validity of any of the remaining provisions. By signing below the parties warrant having the legal authority to enter into this Agreement. We've included a Waiver of Moral Rights in our work for hire template (see 2d) and stated that the Company has sole discretion about attribution or credit to the author. However, Independent Contractors who wish to remain anonymous need to be aware that a waiver of moral rights is also a waiver of the right to anonymity. It doesn't have to be an all or nothing though - moral rights may be waived in whole or in part. If your country does not make use of the term "work-for-hire" in copyright law (e.g. Canada) you can replace it with the term "commissioned work" and title the document "Independent Contractor Agreement" or "Graphic Design Agreement" etc. In our sample work for hire contract we use the word "Company" to denote the client. You can replace that with a person's Name, Creative Firm etc. Similarly, where we used "Contractor" you could use Artist, Freelancer, Service Provider etc.